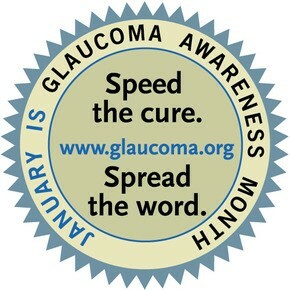 January is National Glaucoma Awareness Month, the purpose of which is to raise awareness about a leading cause of vision loss and blindness. Glaucoma is called “the sneak thief of sight” because there are no symptoms and when vision is lost, it is permanent and cannot be reversed. As much as 40% of vision can be lost without a person noticing. Glaucoma is a chronic neurodegenerative disease that causes increased pressure in the eyes. This damages the optic nerve that is the connection between the eyes and the brain. While it is incurable and the damage it causes is irreversible, it can be treated by eye drops that lower the pressure in the eyes and/or surgical and laser procedures that may be able to prevent further deterioration to the eyes. However, if it remains untreated, glaucoma can lead to vision loss and blindness. It can affect one or both eyes. Since it causes no symptoms, it can only be detected with an eye exam from a proper ophthalmologist (eye doctor). Aging is a high risk factor and seniors age 60 and over must have a yearly eye examination, as the earlier it is detected and treated, the more eyesight can be saved. A study published in Science, February 17, 2017, found that Vitamin B3 also called niacin, when added to drinking water of mice, prevented eye degeneration in glaucoma-prone mice and stopped further glaucoma deterioration in old mice that already had glaucoma. The study headed by Jackson Laboratory Professor and Howard Hughes Medical Investigator Simon W.M. John also showed that abnormalities in the mitochondria of nerve cells (neurons) came before degeneration could be detected in the eyes of the mice. The researchers also discovered that levels of an enzyme nicotinamide adenine dinucleotide (NAD+) in the retina of the eyes decreases due to aging. Most Vitamin B3 niacin that is consumed in the diet changes to NAD+ in the body and this helps to increase the levels of this necessary enzyme which has been lowered in the eyes by aging. In fact, even when pressure in the eyes of the mice rose, they did not show any eye deterioration, so getting enough Vitamin B3 niacin in the diet may protect eyesight. Since Vitamin B3 (niacin) prevented glaucoma in mice that were prone to it and treated mice that already had developed glaucoma, the researchers hope to test Vitamin B3 niacin on humans. If Vitamin B3 niacin is successful with humans, it could offer a natural, safe and inexpensive way to prevent and also treat glaucoma. In the meantime, no harm can come from adding niacin-rich foods to your diet that may help to prevent glaucoma and protect eyesight. Niacin is abundantly found in nutritional and Brewer’s yeast along with all the other B complex vitamins except for Vitamin B12. Brewer’s yeast also contains necessary minerals like selenium and chromium. All B complex vitamins strengthen the nervous system. Fish, especially tuna, mackerel and salmon are rich sources of Vitamin B3 niacin. Yellow, orange and green leafy vegetables like sweet potatoes, butternut squash, winter squash, corn, pumpkin, broccoli, spinach and peas contain Vitamin B3 niacin. Interestingly, these also contain lutein, which also has also been scientifically proven to be beneficial for good eye health. Research also shows that Vitamin B3 niacin helped to prevent memory loss, cognitive decline and Alzheimer’s disease (AD) in mice. To read more about this see our blog post from February 15, 2018. According to the Glaucoma Organization, more than 3 million people in the United States and 60 million people worldwide have glaucoma. However, it is believed that half of them do not know they have this disease, which silently progresses while destroying vision. The National Eye Institute projects that this number will reach 4.2 million by 2030, a 58 percent increase. Glaucoma is the leading cause of irreversible blindness. In the United States, approximately 120,000 are blind from glaucoma, accounting for 9% to 12% of all cases of blindness. The World Health Organization (WHO) estimates that 4.5 million people worldwide are blind due to glaucoma. African American and Latino populations are more at risk for glaucoma and must have a yearly eye exam from the age of 40 to catch it in its earliest stages. A type of glaucoma called narrow angle glaucoma is most prevalent among Asians and Native Americans. The Glaucoma Organization fears that with the increase in the aging population, an epidemic of blindness is looming. Thus, we must raise awareness about the importance of regular eye examinations to preserve vision. Research is showing more and more how important good nutrition is for maintaining good health and preventing chronic diseases. The Royal Suites Healthcare and Rehabilitation in scenic Galloway Township, New Jersey takes nutrition very seriously and their chef works under the guidance and supervision of a registered dietitian to insure that the residents get the tastiest and healthiest cuisine possible. They also take care of those with special dietary needs. Vitamin B3 (niacin) prevented glaucoma in mice that were prone to it and treated mice that already had developed glaucoma and hopefully this will pave the way for a safe and inexpensive way to both treat and prevent glaucoma in humans.